This is our Joomla! 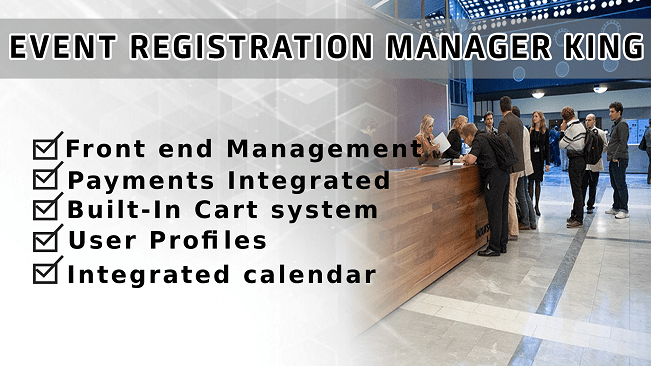 Event Registration Management System. Event Registration Manager King is a one of a kind software for your website be it a university or a company. It is appropriate in the handling of online tutorials, online portal registration and payments for different proceedings in any online podium you have. With its amazing features, you can have easy time handling a variety of activities with just a single software package. With the Event Registration Manager King, just a click and all the components of the software are installed in their default form and you can make adjustments you want. The software is easy to navigate through and configure There are general settings tabs like currency and tax, intro text, event handling, registration handling, display settings, image settings, integration options and other tabs that make it easy to organize your application as you desire. Easy event and user management. Event registration Manager King guarantees easy usage by adding events fast and the number of users can be quickly added as well. Before creating any event, you have to create a category, location, registration form and payment plugin. Event Registration Manager King is able to handle different events, forms, categories, locations, reports and different statistics at any specified time. The presence of an Order manager allows you to change the status of your orders in your platform. For instance, you can change an order from available to pending and later on to completed depending on the activity involving the order. With a dashboard tour, you can navigate through everything in your application and also make adjustments in any field you need changes done. The user dashboard enables all the registered customers to access their orders, register for events and check event history, access the user profile and manage the instructor or organizer profile. The dashboard is available for all users that are logged in and they can therefore use the application efficiently. Event Registration Manager King allows many options in displaying all input data. Therefore, you are able to control what your visitors and users see. You can input colors and fonts of your choice making your application as you need it. You can also make adjustments and choice of display sections which includes; time and date, shopping cart view, event categories grid, event list, event details and event countdown and timer. To ensure safety of all data in the application, there are frequent application updates. The system ensures the latest version of the software which has advanced features and security for its users. When you update your Event Registration Manager King, you follow the procedures of installation. You don’t need to uninstall the previous version to make an update because all changes made in the previous version will be overwritten once you update it. Event Registration manager has proved to be among the best applications used by many companies, universities and other tuition institutions, both government and non-government organizations and many other companies. Its effectiveness in handling online working portals, tutoring portals and transactions online has enabled many users resulting in its usage. Join the many users of Event Registration Manager King to ensure fast, safe and efficient activities for your application. Event King manager software allows users to create events. Multiple event categories with adjustable colors. Event Registration Manager King enables users to use different tabs in the adjustment of date and time. These options include. Time settings which are involved with the location of the company and the registered users. The date and time can be highlighted in different colors depending on what the theme color that the user has selected. The time is visible to both the company and the registered users. Registration manager king allows users to create custom registration forms to store all information about their users. The custom registration forms can be adjusted as the user needs it. Creating a new registration form where users can put their personal information. Adding form fields which range from text area fields, password fields, select fields, file uploads and calendar date field. Field form groups which are mainly to separate personal information from the company information. Customizing thank you pages from the events and registrants. The payment options provided are safe for all users and in case the user needs an additional payment gateway, there are additional payment options in downloads section or in case it is not available, contact our management systems to create one for you. There are statistics which are automated to provide accurate results for all events of the current year. Depending on the customer preference, there are adjustable dates to get statistics of either the day, month or year. The statistics can be in form of graphs, tables or charts depending on the option you select. Showing attendee list on the details of the event page. Automated archiving of some events. Event Registration Manager King will be proven to be one of the best event management systems. This is seconded by the great reviews given by our esteemed users in their previous experience. In case of any shortcomings in the use of our products, we advise our customers to contact our support officials to solve any issues arising to avid bad reviews from our users. Ensure you read all instructions about the software in the documentation provided and the user guide.